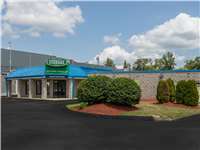 Located on S Washington St just north of I-295, Extra Space Storage serves residents of North Attleboro. Locals will recognize our facility near Holiday Inn Express and Showcase Cinemas. With a wide range of storage units, climate-controlled storage, vehicle storage, and exceptional security, Extra Space Storage on S Washington St has what you're looking for in North Attleboro! Units at our North Attleboro storage facility range in size from 5x5 to 20x30 and include features like drive-up access, first-floor access, and more. No matter what you need to store, we have the space for you! With electronic gate access, 24-hour video surveillance, and an on-site resident manager at our S Washington St storage facility, you can store valuable belongings with confidence at Extra Space Storage! Protect temperature-sensitive items year-round from extreme heat and cold with a climate-controlled unit! These units stay between 55 and 80° at all times and are available in sizes 5x5 to 10x20. Looking for secure vehicle storage in North Attleboro? With 10x10 to 20x30 enclosed drive-up units and 8x20 outdoor parking spaces, Extra Space Storage can accommodate cars, boats, RVs, and motorcycles! At Extra Space Storage, we go the extra mile for our customers to ensure they have an excellent storage experience! Not only do we maintain a clean, secure facility at all times, but our friendly, professional staff is committed to your satisfaction. Contact us today to reserve a storage unit in North Attleboro! For my first experience using a storage facility this one was amazing! I’m a big fan of good customer service and when I get it I stick with it and show my appreciation! All my questions were answered and right away I was set up with a unit that met my needs; anyone in need of storage doesn’t need to go any further than this ?? Great friendly and knowledgeable staff. Very difficult contacting a person at this location. Each time calling this location, I was passed through a voice messaging service. I called back a number of times in hopes to getting a live person. Everyone has been very helpful and courteous. I have received 2 phone calls asking if everything was alright and stressing the staff are available if I ever need anything. I am very happy I chose Extra Space Storage. I secured a 10'x20' storage space here. Upon my first inspection before I actually paid anything, I was very impressed with the cleanliness of not only the space itself, but also the overall neatness of the entire grounds. The assistance was first rate, personable and friendly. A week after I had moved in, they called me to ask if everything was alright and if I had any problems or issues. That is great customer service! I will gladly and honestly recommend this location if your looking for the things I have just described. Managers and workers are very helpful and professional. Very clean storage unit. No problems with bugs for mice etc.. Very well kept and as I stated staff is great !! This is the second time I have rented from Extra Space Storage. Their units are very clean, and easy to get to. I have never had a problem with anything in my storage unit. My stuff has always come out of the unit the exact way it went in. I would rent from Extra Storage Space anytime I need to stuff. The staff has always been very polite and courteous and take the time to answer any question you have, or take the time to explain anything in the contract if you have questions. Rented for the first time, staff was very accommodating and friendly. Facility is extremely clean and well kept with great security, manager lives right on site in a house. This is the best storage unit I ever had. Great customer service. Very clean and the location is perfect for me! I would totally recommend Extra Storage in North Attleboro to anyone I know that is looking to store some extra stuff. I've used the facility twice, with the second time under this franchise name. Great staff, friendly and helfpul. The place is well-maintained too! The location and easy access are both great features. The unit and building cleanliness are impressive. This place gets "2-thumbs up". I was looking for some place reasonable to store my trailer and this was the most reasonable, taking into consideration distance and route of travel when trailering to my vacation spot. There are other less expensive spaces, but this is right on my way to the highway so it worked out perfectly. Can't beat the price and the security is great! good selection. Friendly and knowledgeable Manaager Mario. It is very nearby, very reasonable price and I feel safe going there at night. Hi, I have used this facility on 2 seperate occasions over the past few years and i would recommend them to everyone for their friendly and timley service. Their facilitys are clean, safe and convenient. Its been my pleasure to do business with them and i will continue to do so in the future. This facility is extremely convenient. Hours of operation is perfect for my inconsistent work/life schedule. Gates open nice and early and excess into facility stays open late enough for me. I feel pretty safe when I am there after dark hours knowing security is in play. My storage unit is perfect for my choice in life style. I didnt want something huge but I couldnt do a small unit either. So I really liked the choices I had to choose from. I approve the area, CUSTOMER SERVICE, and Price! I am one happy client. You guys are amazing. The help that you gave us when needed was perfect. I will always recommend you guys for storage needs. Great facility and the Manager was awesome too. Thank you. Drive south on Washington St. Pass CVS and continue straight. Our facility will be on the left after you pass Riverview Dr.
Drive north on Washington St. Cross I-295 and continue straight. Our facility will be on the right after you pass Quinn St.
Drive west on I-295. Take exit 1B and turn right onto S Washington St. Our facility will be on the right after you pass Quinn St.
Drive east on I-295. Take exit 1B and merge onto S Washington St. Our facility will be on the right after you pass Quinn St.